Mesmeric Magazine, or Journal of Animal Magnetism. Boston, MA. Publisher: Saxton and Pierce. Editor: R.H. Collyer. 1/1, 1842. 32 pp., $2.00 a year. 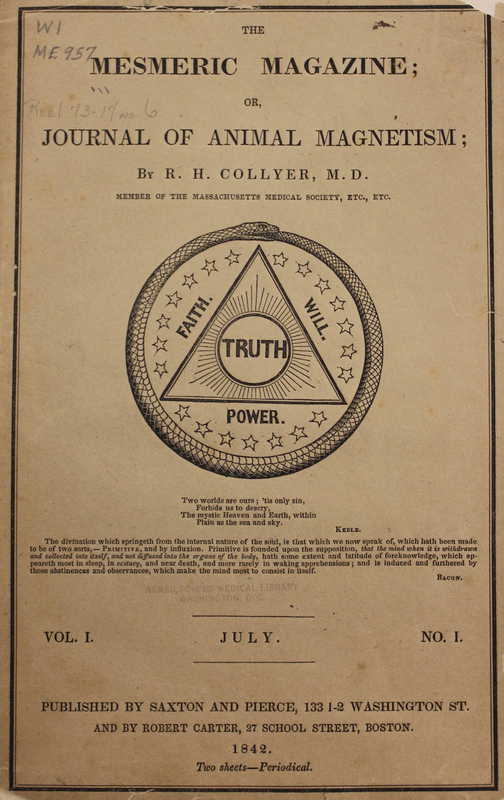 The journal announced its purpose in the first issue: "Devoted entirely to Mesmerism or Animal Magnetism, in its various branches of Phreno-mesmerism, Patho-mesmerism, Physiogno-mesmerism, Psycho mesmerism, &c. The most minute and accurate details will be given of numerous highly interesting experiments in Clairvoyance, particularly in the Spiritual World, and in the Moon and Planets; and also of an immense number of mesmeric examinations of persons afflicted with various diseases. Letters from the most distinguished Mesmerists in this country and in Europe,will form a prominent feature of the Magazine." Crabtree 459. NY Academy of Medicine; NY Historical Society; NY State Library; Buffalo and Erie County Public Library; Washington University; Brown University; and other locations in OCLC.